A singer who managed to attract an audience of more than 100,000 people to webcasts from her living room has signed with a major record label. Sandi Thom, 24, originally from Scotland but who lives in Tooting, south-west London, is now on the books of RCA/Sony BMG. The official signing will be webcast on Monday evening. Ms Thom carried out a "world tour" from her flat by performing 21 online gigs on consecutive nights. Ms Thom's initial performance attracted an audience of just 60. 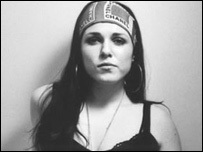 She has been compared to fellow Scot KT Tunstall as well as Janis Joplin. The singer said she got the idea for the tour after the car she used on a real tour constantly broke down.